So, what can I say about an eyelet dishcloth? For some reason I really wanted to make a dishcloth and had randomly bought four balls of super cheap-o kitchen cotton from Big Box Craft Store. At the time, my swift was still on its way and I needed to kill some knitting time before I could start on my lace. I saw the pattern in Knitting for Baby and decided I would make one like that. I cast on four stitches, proceeded to follow none of the pattern instructions, and wound up with this dishcloth. More exciting: Alex wanted to see some lace! So lace you shall see. Yes, despite my adventures in winding laceweight, I opted to knit with the yarn that comes in a giant cone. It’s Jaggerspun Zephyr in color Cinnabar on Addi Turbos Blunti Stumpos size US 3. You can see a picture of what it’ll look like towards the end of this post. The first two rows were murder, I tell ya. 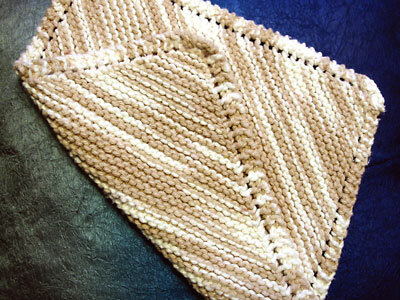 It took four cast-on attempts, I think, to actually successfully get the shawl started. It was like trying to thread a sewing needle with rope. I got so frustrated with it that I actually left a mistake I made in the first or second row, figuring that it would get hidden when I attach the edging anyways, just to avoid having to frog and start again. Now that I’m past the first few rows, the Blunti Stumpos don’t bother me so much, except occasionally on the k3tog. And now, back to studying for my systems neurobiology exam. Didn’t I just have one of those, not that long ago? Yes. 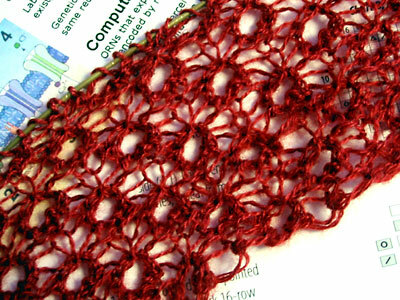 CogKnition posted this on March 15th, 2007 @ 4:36pm in Dishcloths, Finished Objects | Permalink to "Eyelet Dishcloth"
I thought that lace looked familiar… I have looked at that book a bunch of times and that’s one of the patterns that made me almost buy it on several occasions… Very pretty! Ahh, thanks. Gorgeous. It’s the triangular red one, yes? That was my favorite out of the ones you showed, though all of them were beautiful. I just started that Curved Shawl last night and have already ripped out the first two rows now for a total of three times! Can I not count or what? Those first rows just don’t jive. I checked the XRX Books corrections (nothing consequential). Do you have any tips? What am I doing wrong?